ATTO is one of the oldest drive benchmarks still being used today and is still very relevant in the SSD world. ATTO measures transfers across a specific volume length. It measures raw transfer rates for both reads and writes and places the data into graphs that can be very easily interpreted. The test was run with the default runs of 0.5KB through 64MB transfer sizes with the total length being 256MB. Benchmark Results: ATTO showed the WD SN500 250GB M.2 NVMe drive reaching speeds of up to 1.59 GB/s read and 1.21 GB/s write in the standard overlapped I/O benchmark. This is just below the drives 530 MB/s max sequential read and 500 MB/s max sequential write speeds. 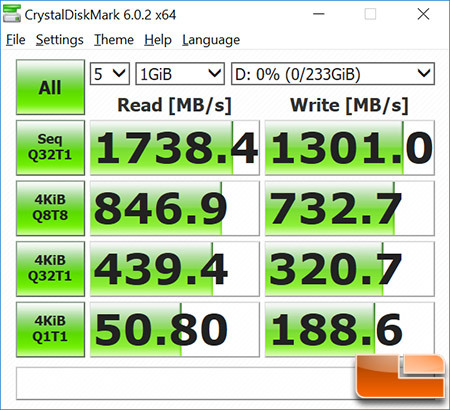 CrystalDiskMark is a small benchmark utility for drives and enables rapid measurement of sequential and random read/write speeds. Note that CDM only supports Native Command Queuing (NCQ) with a queue depth of 32 (as noted) and shows the highest score of five runs. Benchmark Results: When it comes to performance in CrystalDiskMark v6.0.2 we managed to hit 1,738 MB/s in the sequential read and 1,301 MB/s in the sequential write test. 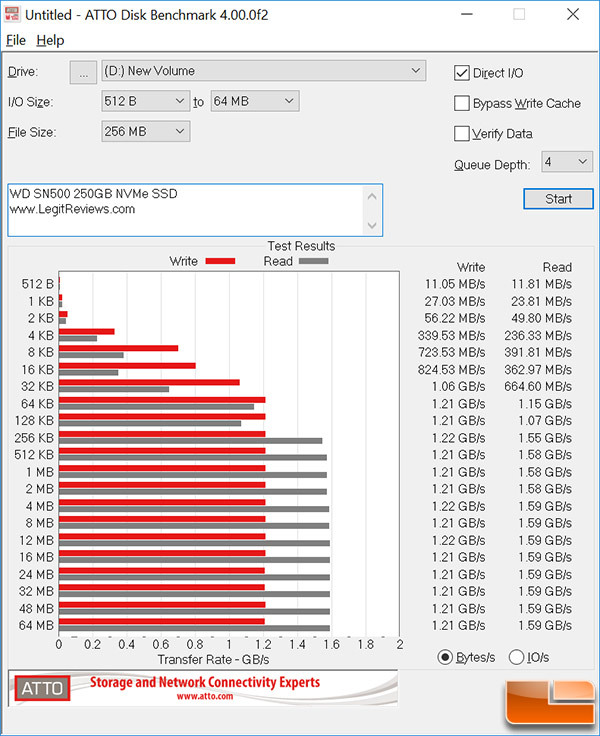 The WD Blue SN500 250GB NVMe SSD is rated as having up to 1,700 MB/s read and 1,300 MB/s write and we were able to just barely exceed both of those values. The Random 4K performance at a Queue Depth (QD) of 1 was 50.8 MB/s read and 188.6 MB/s write. Benchmark Results: Another benchmark we like to run is Anvil’s Storage Utilities 1.1.0 and in that benchmark we got an overall score of 4,960 points when running the benchmark in applications mode (46% compression). 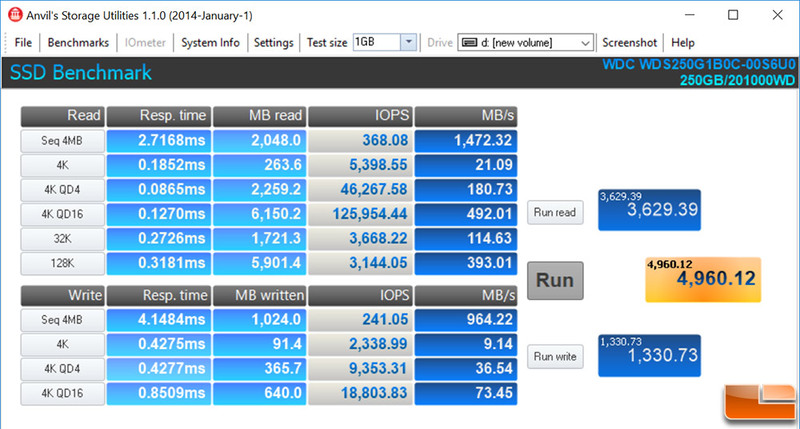 Random 4K performance at a QD of 16 was shown to be just 126,000 IOPS read and 18,800 IOPS write.